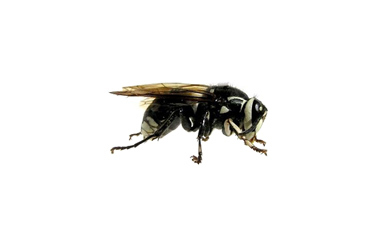 The Bald Faced Hornet lives in wooded regions, building exposed, mottled gray nests in trees and shrubs, and sometimes in building attics and wall voids. Nests built in wall voids may emit a stench. Mature nests usually have 300-500 workers. Nests can exceed a basketball in diameter by the end of summer. Bald faced hornets can be aggressive when aggravated, presenting a significant stinging hazard; professional hornet control is necessary.